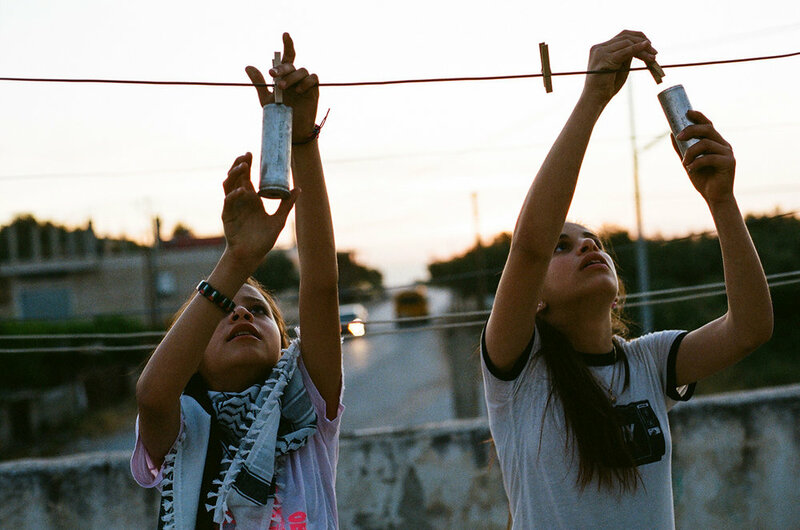 On this International Women's Day, we are honored to premiere the short documentary by Amanda Leigh Smith about Palestine's youngest female journalist, 11-year-old Janna Ayyad and her family. In May of 2017, I traveled to a small village in Area C of the West Bank, Palestine. Nabi Saleh, about 20 kilometers northwest of Ramallah, is noted for their weekly marches to protest the occupation established in 2009 when the neighboring Israeli settlement began expanding into private Palestinian land. Area C constitutes about 61 percent of the West Bank territory where infrastructure is controlled by the Israeli government, impacting Palestinian’s access to school, work, and medical services. If you look through photos taken by Amanda Leigh Smith, you’ll notice a theme. Spontaneity, intimacy, the nostalgic authenticity of a snapshot—and women. An established American photographer, Smith’s archives reveal a stunning scope of stills that reflect an appreciation for travel and feminism. But it’s Smith’s background in social work and political science that lends a weighty narrative to her work. 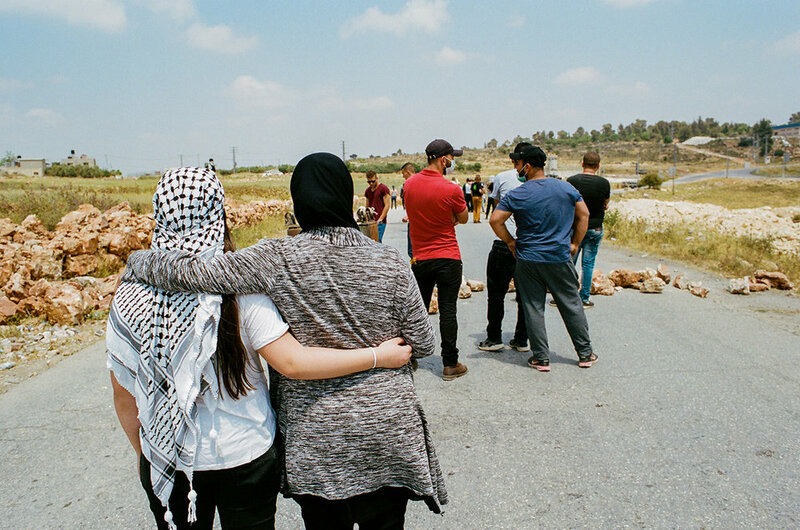 These elements came to a head during her travels to Palestine in May of 2017, where she went as a photojournalist to document the demonstrations protesting Israeli occupation. Not only did she return home with stills, but a backlog of video footage. Months later, Smith screened her first film, A Caged Bird Sings. Janna Ayyad placing a flower she picked from her yard into an empty teargas canister that was shot at her home in Nabi Saleh by Israeli forces. Over the several years she has collected these canisters from around the house and yard to put on display as a way to show her families resistance to the occupation. 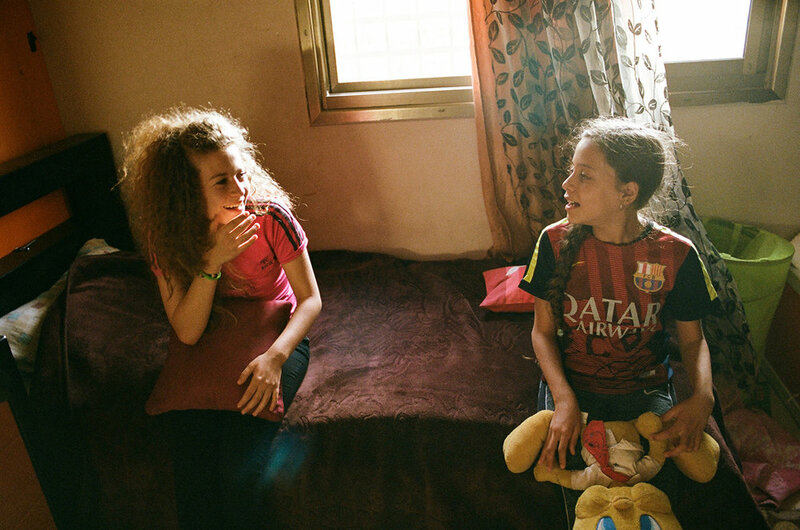 The short documentary follows three women from the village of Nabi Saleh in Area C of the West Bank—Ahed Tamimi, Janna Jihad, and Manal Tamimi. Up until 2009, their lives were what one might call relatively normal, living under Israeli occupation. That year, the neighboring settlement denied their small village access to the local water source, a natural spring — and the people of Nabi Saleh responded. Since then, these women have become prominent activists in the weekly demonstrations to resist the occupation, and fighting for their rights as Palestinians and as humans has become a way of life. Last May, Smith was invited into the home of the Tamimi’s. Her lens captures the three activists in a humanely familiar light: as people much like ourselves. They worry for their children, they take silly selfies, they draw flowers on their bedroom walls, all while the reality of the occupation is at their doorstep. Yet the adversity these women face has not dispirited them, but pushed them to respond in an extraordinary way. Seventeen-year-old Ahed Tamimi faced an armed Israeli soldier an hour after her cousin was shot in the head with a rubber bullet last December. She became globally recognized when a videotape of her slapping the soldier went viral, and four days later Ahed was arrested in the middle of the night by Israeli military. She currently awaits the fate of a constantly-pushed trial, which is set for March 11. Her cousin, Janna Jihad, began live reporting on the occupation at seven years old, since she felt it was portrayed dishonestly in the media. Now eleven, Janna is Palestine’s youngest journalist. Manal Tamimi has committed her life to resisting the occupation, understanding the risk of involving her own children is the cost of a greater freedom. A Caged Bird Sings explores the perspective of the brave women who have risen to the occasion in the most unprecedented way—by sacrificing everything they have to create a revolution. Smith joined me in an Italian café in Vancouver, Canada, hours before the second screening of her film. She dove into her experience of a demonstration in Nabi Saleh, shared her views on the resilience of the women involved in the resistance, and how this may affect the media to turn a critical eye on the United States. DAYNA MAHANNAH: You traveled to Palestine last May. How did you end up meeting the Tamimi family in Nabi Saleh? What motivated you to go there? AMANDA LEIGH SMITH: I went to Standing Rock in November and [met] two guys from Bend, Oregon. They had been going to Palestine for the past five years and had filmed a full-length documentary on Nabi Saleh, and invited me to go with them. When I learned about Janna—she’s the youngest journalist in Palestine and she started reporting when she was seven years old—I was really inspired by that story. I just personally connected with who she is and what’s she’s doing. I started doing photojournalism when I was fourteen years old and it was always something that I wanted to do. Meeting her was my main motivation for going. Most of my work as a photographer and journalist does focus on youth and women’s stories. I used to be a social worker. I was a case manager for a homeless shelter in Portland for several years. Youth issues are something that’s personally important to me and I have focused on that in other aspects of different jobs I’ve had. As a photographer, a lot of the stories or clients I gravitate towards are supporting young women and people who are underrepresented in the media. I also have a BA in Political Science and I spent a lot of my undergraduate focusing on politics in the Middle East. I’ve always been really interested in what’s going on over there and have always been drawn to travel there and do photojournalism stories, so it just lined up like that. DM: It kind of alchemized into the perfect focal point. Do you have any hopes for who the film might reach, or do you have any plans to go back? ALS: I’d love to go back and do a full-length film or a series. I made so many great connections while I was there and heard pieces of all these stories that I think should be told. So I’m hoping I can use [this film] as a tool to apply for some grant funding. There’s a lot more to say about the situation; I only had two weeks. Also, I shot it on my phone… I’m definitely proud of what I made, but I wasn’t intentionally trying to do it and I didn’t have equipment I would like to have, so it would be nice to make something that was more intentional and higher quality. DM: Of course. Was there a media company you were working for? Or was this a freelance project? ALS: Well, to financially afford the trip, I ended up working with Obey, the clothing company. They started out as a skate company but they’re more of a politically charged commercial business. They helped financially get me there, and so I shared photos through their magazine. I was also originally going to be putting the story out through an organization called Girl Gaze. It didn’t quite line up because I felt really protective of the message and wanted to make sure I was in control of how the narrative was told. It was kind of a situation where they wanted to use an outside editor that I didn’t know. The editor has so much power. ALS: Especially because [the subjects] are minors and are living in a war zone, and also, the Israeli government uses social media to make arrests and to target, I wanted to be completely in charge of what was said. I didn’t want someone who wasn’t there to be writing captions or telling the story because I felt responsible. I didn’t want to put anyone in danger or show them in a light that didn’t accurately represent who they were. I ended up deciding to do it on my own, which I’ve never done before. I also didn’t film it with the intention of doing a documentary. I mainly was shooting stills and video was secondary… it wasn’t that structured. It was very much like: “What do you want to say to the world? Can you tell me about this? Show me your room.” I just let them have total control over what it was that they wanted to say. I tried to be a fly on the wall and just observe. DM: That comes across in the film. It doesn’t seem prompted, and it’s definitely not the content you usually find about Israel and Palestine. ALS: I’d like to think the message of the film is not about Judaism and it’s not about questioning their beliefs, but rather just… providing a humanist perspective of Palestinians and what their daily life is like, because most Americans don't see that in the media. If you just watch your normal news, it’s not talked about—only until very recently, actually. One of the girls, Ahed Tamimi, was arrested December 19th and that’s the first time that mainstream media has actually started talking about Palestinians in a positive light, and talking about human rights violations and about arresting Palestinian children. I’ve never seen that in major news outlets in the US, so I feel like it’s a really big deal that they're talking about it. It’s pretty incredible that it also just happens to be the same family that I spent time with there. DM: So much has happened in that community since. I saw, in some pro-Israel media outlets, Ahed called a “Joan-of-Arc type”, that her light skin and hair is attractive to Europeans and Americans, and that it allows them to feel more compassionate to her personal story. ALS: I read some of those articles and also read that [the Tamimi’s] are like “actors”, that they are a paid family, which is completely… horrifying to read that. I’ve traveled all over the world and some places I've gone, I definitely feel like I stick out for whatever reason. When I was in the West Bank, I did not feel that way at all. I felt like I could relate to everyone I met there, based on their physical appearance and their clothes and the things that they were talking about and their education level. I met a lot of people who are way more educated than I am, who have master's degrees and wonderful careers and hang out at cool hip coffee shops and eat pizza. But I do think that physical appearance does play a role in social movements. As humans we pass judgements on how people look. [Ahed Tamimi] was just by chance born in Nabi Saleh, her parents are activists, and the village also is in Area C. So many villages in Area C of the West Bank have these demonstrations, but Nabi Saleh… they want to lead the charge for a third intifada. They want to start another revolution. They want to protest for their right to exist peacefully in their homeland. So they make conscious decisions to use media and to do these demonstrations and to use non-violent tactics to gain international support for their cause. Ahed Tamimi’s bedroom. A typical teenage room with a messy bed, drawings on the wall, art from friends, headphones, acne face wash and perfumes. Inside the home of Manal Tamimi, Janna’s aunt. Janna lives in the apartment adjacent to Manal and her cousin Rand. DM: What’s the other choice in that? Are there people who choose not to take part? ALS: There’s definitely a choice to not be involved. You're still affected by it—there’s no way to ignore the reality that you are basically under military control of another country. But you cannot show up to the demonstrations… A lot of people criticize the parents. Even my mom, I remember saying, “Why would you let your kids go to the demonstrations?” and, “Why would you want to get them involved?” You can’t not. Because you have a baby and you're in your home and almost every week the military is storming down your door in the middle of the night, throwing tear gas canisters inside your home. If you’re a child born after the wall [Israeli West Bank barrier] and you live in a village in Area C, there is an armed tower guarding the road and a military person with a sniper looking down at you every day of your life. You're going to grow up and that’s going to be your reality. So no matter what your parents think, you’re involved. You can’t not be. I thought that the parents of Janna and Ahed were amazing, and would not once question their methods of raising their children. If I was in the same situation, I would hope that I would be doing the same. I would hope that I would be fighting to protect my children. The [demonstration] I experienced was a pretty chill experience, in this weird way. This parade, kind of, starts. People start walking down the street. They're singing songs and there’s kids… maybe they’re playing soccer in the street. They just walk through the village to the village entrance where the watchtower is. There’s also a gate there. Usually every Friday the military closes the gate, and prevents people from going in and out of the village. (left to right) Ahed Tamimi, Janna Ayyad, and Ahed’s mother Nariman outside of their home in the village of Nabi Saleh, West Bank, Palestine. Janna Ayyad and Rand Tamimi on the roof above their home in Nabi Saleh. Their home is littered with hundreds of teargas canisters that have been launched at their home over several years. The children have turned them into play things that they kick around like soccer balls or throw potatoes at. DM: What is in the village? What does that cut off access to? ALS: School. The only thing in Nabi Saleh is a gas station, a little market, a mosque, and a community space that is a two-room cement building with some computers and hookahs. There’s a little business where you can get a coffee, buy shisha, smoke hookah, and hang out with friends or play computer games. That’s all, basically, aside from homes. So when [the military] closes the gates, Janna can’t go to school. Her grandmother’s on dialysis, so she can’t go to the hospital. Most people work outside of the village, so it prevents them from going to work. DM: You said you never felt like you were sticking out, but did you ever feel that you were in any sort of danger? ALS: I felt scared of the Israeli military. Going into the West Bank, the checkpoints are really intense and scary. When you’re confronting someone who’s holding a semi-automatic rifle, it definitely makes you feel uncomfortable. But I never felt threatened by Palestinians. I never felt unsafe from that aspect. I always felt like they were really warm and welcoming wherever I went. We went to a flower shop at one point and some guy gave me a rose. He didn’t speak English, but he gave me a flower and wanted to friend me on Facebook. Palestinian women from the village of Nabi Saleh on the front lines during the demonstration protesting the Israeli occupation and neighboring settlement that took over the village’s natural water source in 2009. These demonstrations typically occur every week on Fridays when the Israeli military closes down the road into the village. DM: What about at the demonstration you went to? ALS: The demonstration I was at in Nabi Saleh was a very relaxed environment in a weird way, but [the Israeli military] were also launching tear gas. The military ended up bringing out live ammunition. Everyone in Nabi Saleh was unarmed. There were some people throwing rocks, which is just what they do, so everyone has their opinions on whether that’s being violent or not. I was scared then. I did not want to go to the front lines because I was also not there to be an activist. I was there to document. I did not have proper press gear—I didn’t have a vest that said PRESS, I didn’t have a helmet on. I was nervous that [the military] would not be able to distinguish me, that I could have looked like a Palestinian and they could have shot at me if they wanted to. But also, when you’re wearing a bunch of press stuff, you can be targeted because you’re press. So I’m not really sure what is better. Once the military started opening fire I was terrified. Four boys were shot that day. There were times when I was filming and hiding behind a rock because they were shooting live ammunition up the hill. That was something I’ve never experienced before. DM: I can’t imagine… in that environment, you’d be in a constant state of stress. ALS: I think a lot of people are, but you normalize it. On some subconscious level you’re probably always experiencing that, but I think for most people that I met, that was just normal life for them. For a lot of them, their form of resistance was to not let it affect them that way, to maintain peace and happiness within themselves. To go out and listen to live music and go have a party and go to the pizza shop and hang out with friends and make art. To just try and live a normal life and not let it bring them down and take away from their own personal happiness. DM: What do you hope this film shows the rest of the world that they don’t already yet know about the people of Nabi Saleh? ALS: Just that they’re human. They are not that different than us. I have a motive as an American to convince more Americans—I want them to feel differently about Palestinians. Right now, most Americans think that Palestinians are terrorists and and extreme Muslims, and that women have no rights there. Ahed Tamimi, age 17, was arrested in December 2017 at 3am by Israeli forces after she confronted a solider the previous day. According to her father Bassem, at least 30 soldiers were involved in the raid of her home and arrest. According to Palestinian NGO Addameer, more than 12,000 children have been detained since 2000. My experience was that women were head of households. They were powerful and they were full of grace and kindness and hospitality, and incredibly strong. Their husbands were not in their way, but were supporting them and supporting their daughters. I think that as a Westerner, and especially as a feminist, it’s important to be open-minded about what that looks like across the world. As Westerners, I think that our opinion on Muslim women should be opened a little bit. DM: Amnesty International put a call out for the release of Ahed. What do you think is going to happen? How do you feel about Ahed being arrested? ALS: A lot of people have asked me that question, and I don’t know. It was really upsetting when I heard about Ahed’s arrest. Also, Janna’s cousin Osama was recently arrested. He was almost like our guide when we were there. He is just this angel of a human. He’s just so sweet and funny and so full of life. To think about him walking home from work and basically being kidnapped by Israeli military, and his family not knowing… is really upsetting. I feel helpless. It’s frustrating in a lot of ways. I don’t know really what I can do, but I know that they're so strong and they are such an amazing family… I know that they’re feverishly working to do everything that they can. So they're not helpless by any means. I'm not surprised she was arrested. I also would not be surprised to find out that someday soon Janna will be arrested or worse. They’re all very aware of the risks. There’s not a ton of outcomes for their situation currently. Things would have to drastically change very quickly in the United States and the state of Israel for them to have a really happy ending. It’s kinda scary. DM: What sort of things do you think need to change? Janna Ayyad, Palestine’s youngest journalist at age 11. She climbs up a tower of rubble from a home in her village that was demolished in the middle of the night in 2015. Palestinian’s homes in Area C of the West Bank are at a constant risk of being demolished by the Israeli army on grounds that they don’t have proper permitting, but these demolishes often leave families homeless, displaced or forced to live in refugee camps. ALS: Most American politicians run on platforms that are pro-Israel. I would like to see more Americans vote differently and vote pro-Palestinian, and to challenge the way American tax dollars are spent in Israel. During the Obama administration, there was a 38-billion-dollar arms deal that America made with Israel. They use that equipment to harm Palestinians and mostly children. If Americans could see a more humanistic view of Palestinians and could relate to them, and feel empathy for their experience, even if they want to still support the state of Israel, they could think, “Do I really want to support a government that commits human rights violations? No. Okay, we’ll help you, we’ll give you aid, we’ll be your ally, but you cannot commit human rights violations.” I think that that would be a huge step. So that’s my ulterior motive: to ultimately convince people to vote differently. Janna with her mother Nawal and grandmother at home in Nabi Saleh. Janna tells her mother all about her upcoming final exams at school that she’s nervous about and how she’s very excited about spring break.